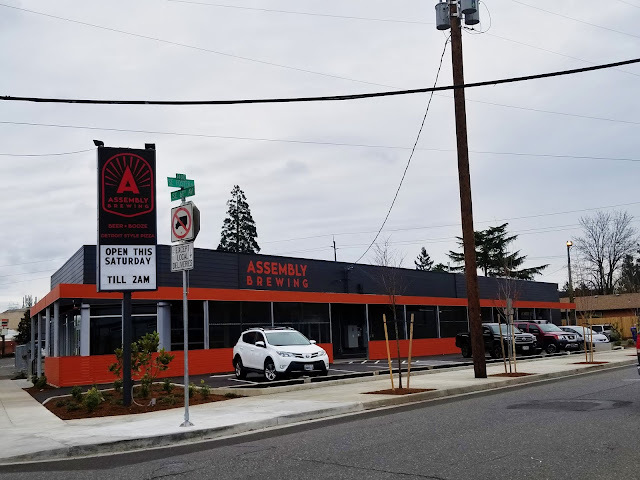 Today marks the official opening of the latest addition to the Portland Brewing scene, Assembly Brewing. Located on busy SE Foster in what had been a grocery store since 1948, the new charcoal and orange paint job makes it hard to miss from any direction. With plans to be open from 11am - 2am daily making time to stop in to check them out shouldn't be too hard. We had a chance to check out the beer and food earlier this week and hear from owners Adam Dixon and George Johnson. 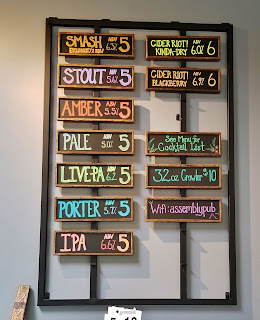 The beer, according to George, is intended to be "flavorful, balanced and drinkable" with the goal that one can have a few pints and remain upright. The beers will be brewed in the 5.5% - 6.5% range and from the ones that we sampled, we agree that they do hearken back to the days before hop bombs and aggressive ABV beers became so common. The SMaSH, using 2 Row malt and Ekuanot hops, hit a high note for us with its bright, light hoppiness and easy drinking quality. 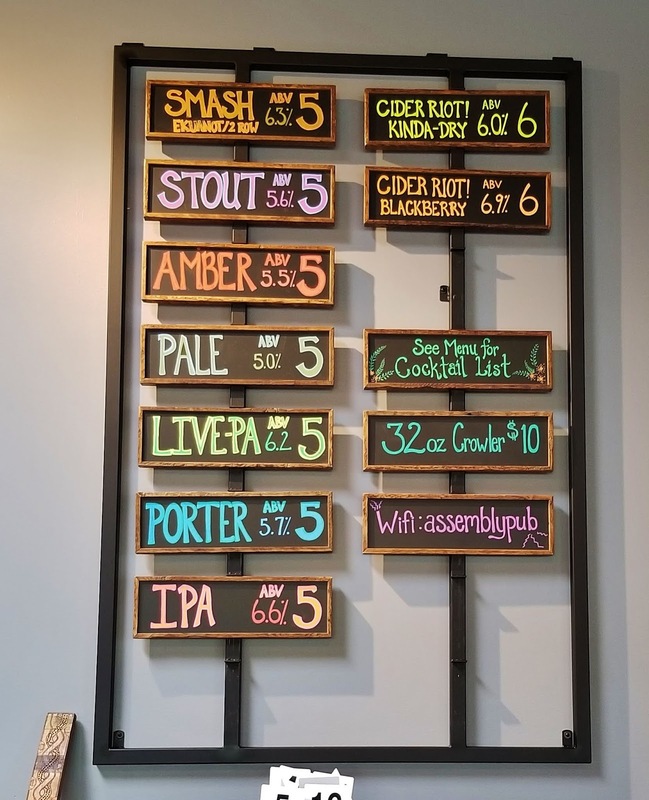 In addition to their seven beers, they're also offering two Cider Riot! ciders and a handful of cocktails. 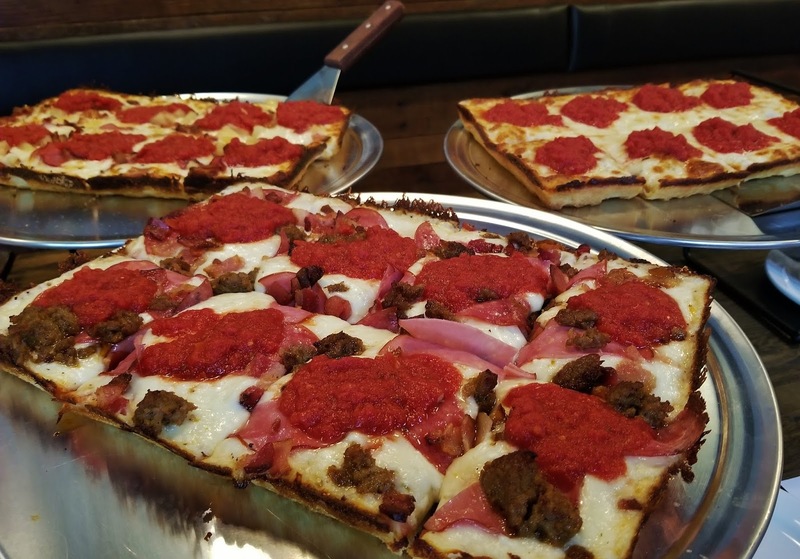 On the food side, the focus of the menu is on their Detroit style pizza which George makes from a proprietary dough recipe. Apparently the style started in a speakeasy and as one may have noticed, has been growing in popularity in recent years. Ex Novo, Ranch and East Glisan all offer their own versions of the square pies, with Assembly's sticking to similar parameters but putting their own touch on it, including the ability to order a veggie or vegan pie. 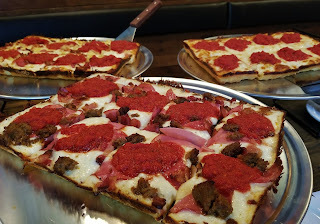 If one isn't in the mood for pizza, they also offer sandwiches, salads and a handful of appetizers. The space itself is big enough for a crowd, offering a mixture of high top and standard tables. An extensive mural dominates two of the walls and is worth taking the time to fully appreciate. There is also outdoor seating between the building and the 12-space parking lot. With spring just around the corner it will no doubt see plenty of use. As pinball fans we were thrilled to spy three machines - Ghost Busters, Hurricane and Theatre of Magic - that will need some of our attention next time we're in. 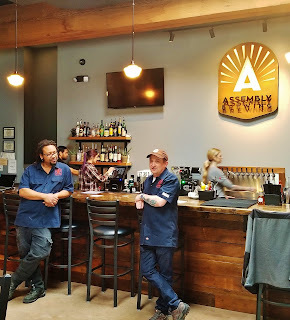 Adam, on the right, said that they hope "Assembly Brewing will become a cornerstone of the Foster-Powell neighborhood." It's a neighborhood that is changing and one that had been devoid of a brewery, with the closest ones being Hopworks west on Powell, Double Mountain south in Woodstock and Zoiglhaus to the east. The grand opening, next Saturday, March 29th, will include live entertainment and some of the local artists that contributed to the aesthetics. Check out all of the details on their Facebook event.